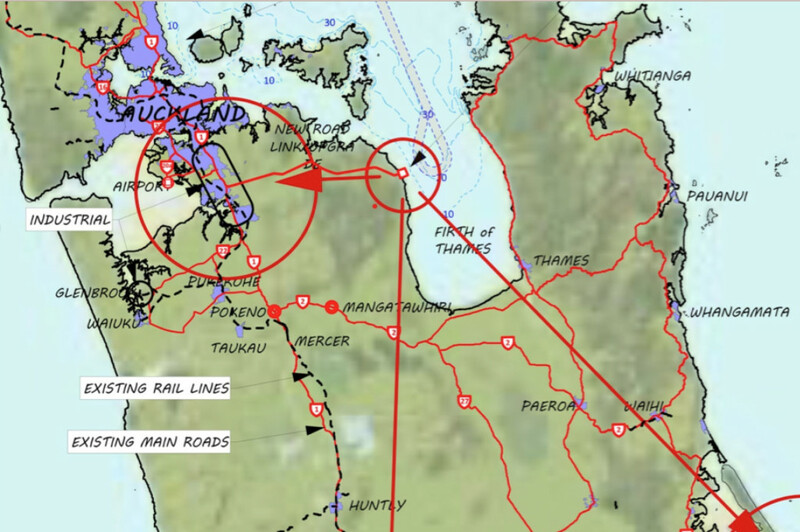 A Private Project to Relocate the Ports of Auckland to Waimango Point, Firth of Thames. This concept would relieve the current pressure of the Ports of Auckland to expand into the Waitemate Harbour which is creating public controversy. Firstly by moving the port to Waimango Point it would create a new modern port using all the latest technologies and would be a truly Green Port to the highest International specifications and would make New Zealand a world leader in container port design. Secondly by vacating the Ports of Auckland wharfs and port facilities would create an extraordinary opportunity to expand the current Auckland waterfront for cruise liner terminals, commercial enterprises, hotels, a sport arena, conference centre, public buildings, a new National bus station with links to Britamart, carparking and luxury apartments.